Are you following us on social media? If so, now is the time to start because we love doing giveaways! The past two months have been filled with wonderful submissions from all of you, and we’re excited to offer our products as a thank you for the support. Our biggest giveaways as of lately have been with Monteverde USA inks, which come in a dazzling variety of over 50 shades. We offer 30 ml and 90 ml ink bottles, as well as ink cartridges for pens. The past two giveaways have been highly animal-themed! We celebrated Shark Week by asking everyone to draw a shark using Yafa Brands products. We received dozens of entries, and everyone who entered was able to receive their ink of choice. Everything from great whites to hammerheads filled our screens, and we’re happy to know that we have so many amazing artists utilizing our products. The giveaway that ended more recently was to celebrate #penandpet posts! We asked our followers to submit a photo of their Yafa Brands pen and adorable pet. It was amazing to see the creativity and sweet faces on all of the entries. 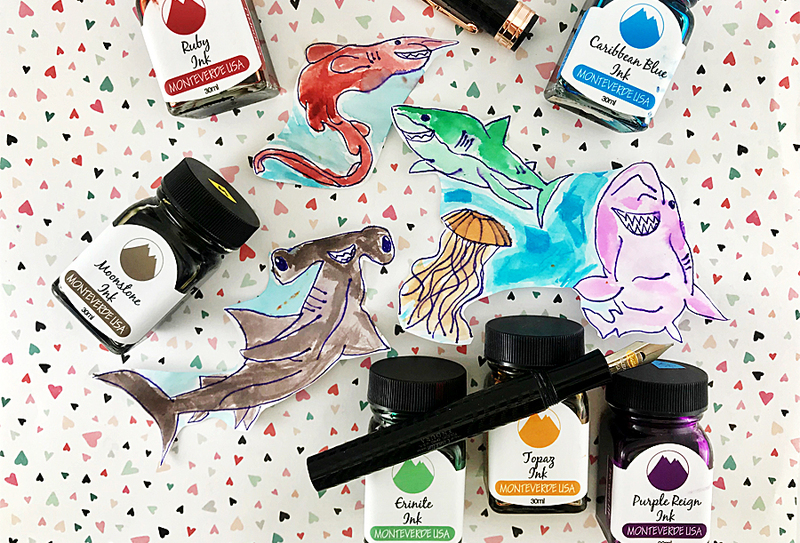 Popular inks that were chosen by many include colors such as Caribbean Blue, Brown Sugar, and Olivine! We also do pen giveaways, and collaborate with other accounts, so watch out for those as well! Pen giveaways result in one winner, while our ink giveaways can equate to each individual receiving a prize! We have more exciting giveaways in the works, so follow the accounts below to ensure that you don’t miss out. You can also tag us in your Monteverde USA and Conklin shots using #teammonteverde and #teamconklin!